Epoxy flooring vs. bare cement. Which is ideal for industrial or manufacturing facilities? Not all industrial or manufacturing facilities are alike and many Facility managers do not feel the need for epoxy floor coatings and instead carry-on with the cement floors that came with the facility. 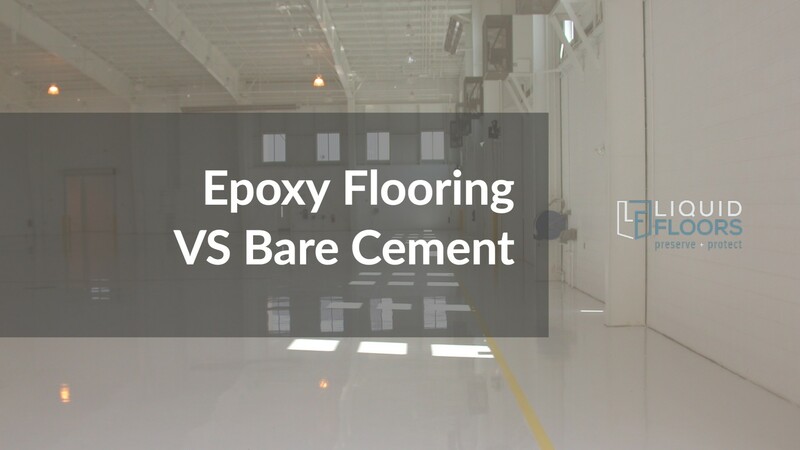 In this article, we are looking at the benefits of epoxy floor coatings over bare cement. Want to increase the output and quality of your workers? Improving the look and feel of your workspace will not only improve the aesthetic, it may also have an effect on the attitude and output of your workers. Anyone who has ever cleaned up a room or a home office knows that a clean and organized looking workspace induces focus, clarity and an overall positive feeling. A dirty and damaged floor may communicate to your workers that the facility doesn’t matter, whereas a clean and beautiful floor inspires pride and cleanliness which may lead to more productivity and higher morale. If you have a facility where spills happen often, you know that these mishaps can lead to dangerous situations. An epoxy coated floor will not only resist water and stains, it will also allow for much faster cleanup. This will intern keep your facility running clean and smooth. Cement by nature, absorbs liquid. Cement is porous and is vulnerable to chemicals, water and bacteria. Epoxy floor coatings provide a layer of protection that will keep your floors looking great and performing even better. Safety is utterly critical. Cement floors are slippery, especially when wet. Epoxy floor coatings provide a layer of traction that cement floors do not have and this amount of traction can even be specified before installation. This will keep your employees safe, but it will also give them more confidence as they work without fear or worry of slipping and falling. When you install Epoxy floor coatings you improve the versatility of the flooring they have been installed on. That’s why Epoxy floor coatings are perfect for flexible spaces that need to be used for a number of different uses. Whether you are using your space for manufacturing, for food production, or for storage or warehousing you can be assured that your floors will be ready for any changes that come their way. Liquid Floors is the number one provider of epoxy floor coatings throughout the Southeast. Call us today for all of your industrial flooring needs.